The Archaeological Museum of Istria, Tourism Office Pula and Association of Tourist Guides have launched a new project “Roman Pula”, wishing to bring ancient Pula closer to tourists who have chosen the city as their holiday destination, so that “Roman Pula” is a sightseeing tour focusing on Antiquity. 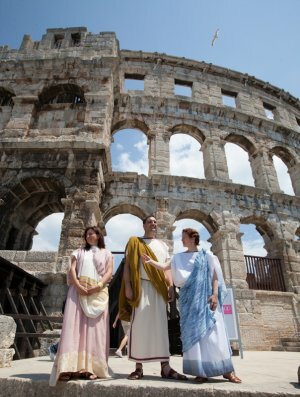 Tourist guides dressed in ancient clothes will tell you the story of Roman Pula. The tour begins in front of the Arena, then continues to the amphitheater’s underground area and then on to the Temple of Augustus. In front of the temple, theatrical group FERR performs the ancient play “Pia”; charming and witty actors announce the play as a somber, cruel and bloody drama in three acts. It is then followed by a walk through the center of Pula, and the tour ends in the courtyard of the Archaeological Museum of Istria where tourist can see how pottery, Roman mosaics and Roman hairstyles were once made, with an especially interesting glimpse into fashion details of Roman clothing. And last but not least, savor and enjoy delicious Roman delicacies! Set off on the adventure “Roman Pula” and be a wealthy Roman for a day, it’s an interesting experience.